I have a tall perennial (6′). Not sure of the species. This is the 3rd year in a row where is being attacked by small worm like bugs. They eat away the leaves. When they are done, they depart, the leaves eventually try to come back and small aphid like bugs come in to do the same. I’ve tried a couple of different bug sprays each year to know effect. Posted about this last year and was recommended Safer’s BTK Biological Insectaside. Just tried it again on Sunday and the bugs are still going. See photo. The plant looks like its been there a while. Is it just old and sick? Anything else I can try? Thank you for contacting the Toronto Master Gardeners about your insect problem. Identification of the insect is key to knowing how to treat the affected plant. Unfortunately, it seems that you may have a Viburnum that has been afflicted with the Viburnum Leaf Beetle. The black worm-like larva are what you see in the attached photo, gorging on the leaf. Once they’ve more or less skeletonized the leaves and gone through several larval stages, in late June they will migrate down the plant to pupate in the soil–they are difficult to see at this point. The leaves on the plant may re-generate if the plant is healthy. In late June/early July they will begin to emerge as adults to feed on the leaves again and begin laying eggs on the twigs for the winter months. This excellent site from Cornell University shows the life cycle: http://www.hort.cornell.edu/vlb/id.html. It explains why the pesticides that were recommended to you were not effective; timing is important. Assuming that this is the correct identification for your problem, it’s important that you deal with it as soon as possible. 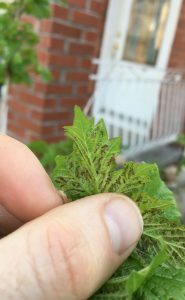 Since your plant has been affected for at least three years by the viburnum leaf beetle, it may eventually die. However, if you are able to prevent these ‘killer bugs’ from creating more damage to your Viburnum, it will survive. All the best and let us know how things progress.